Aileana Kameron, the Falconer, disappeared through the portal that she was trying to close forever. Now she wakes up in the fae world, trapped and tortured by the evil Lonnrach. With the help of an unexpected ally, Aileana re-enters the human world, only to find everything irrevocably changed. Edinburgh has been destroyed, and the few human survivors are living in an uneasy truce with the fae, while both worlds are in danger of disappearing altogether. Aileana holds the key to saving both worlds, but in order to do so she must awaken her latent Falconer powers. And the price of doing that might be her life. Rich with imaginative detail, action, fae lore, and romance, The Vanishing Throne is a thrilling sequel to The Falconer. 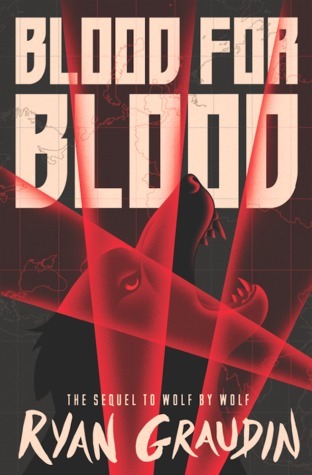 I freakin’ loved Wolf by Wolf, the first book of a series set in an alternate history where the Axis powers won World War II and rule the world. Yael, a teenage skinshifter escapes the horrors of the concentration camp and ends up using her abilities to help the Resistance, competing in a motorcycle race from Berlin to Tokyo in order to assassinate Hitler. Funny how Wendy mentions a cliffhanger, because Wolf by Wolf finished on a pretty open ending too, leaving me antsy to find out what will happen in the sequel, Blood for Blood. Great picks! I liked Wolf by Wolf, so I can’t wait to read this sequel. Nice! That’s a new to me one! Hope you enjoy it once you read it! Can’t wait to pick up Vanishing Throne. The Ryan Graudin – I hadn’t realised this was a series. I will have to go and grab a copy of the first book. I like this author. I read The Walled City which was great. i still need to read The Falconer!